We have a monkey. And we have bananas. In between the monkey and the bananas, we have a stretch of water. With a shark. How will the monkey get the bananas? This almost wordless picture book is a triumph of visual storytelling. There are no wordy sentences here. Instead, the hilarious, energy-filled illustrations do all the work. Occasional snippets of text — such as 'The shark' or 'The monkey' — very cleverly add to the visual humour, with the designer making great use of font selection and type placement to enhance this. I always enjoy watching how children respond to and interact with picture books. I've now read this one with an age-range from three to six. For the three-year-old, I had only to read the scant text aloud (with suitable emotion and enthusiasm!) to have him almost rolling on the floor with laughter. The six-year-old enjoyed the book just as much but quickly told me to be quiet, instead using the simple verbal cues on each page as inspiration for a detailed storyline of her own. For both, the experience was completely engaging. 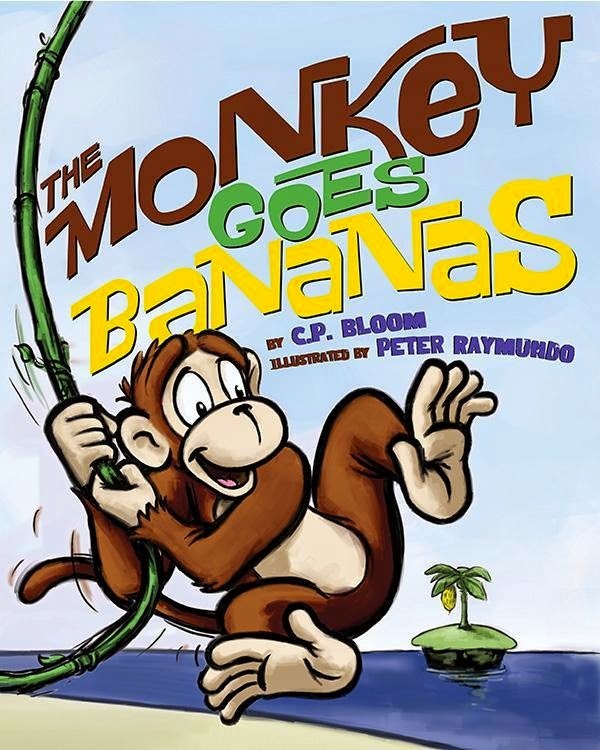 Clever, bold, laugh-out-loud funny, The Monkey Goes Bananas is a winner!